The square-framed aviators take two classic looks and meld them into one badass frame: the squared Wayfarer and the large loop aviator. Any Army-Navy store will be able to hook you up for around $50 – much nicer than $160 for other designer brands. These glasses were designed for the US Air Force and have cruised around in Huey Helicopters and even landed on the moon in 1969. 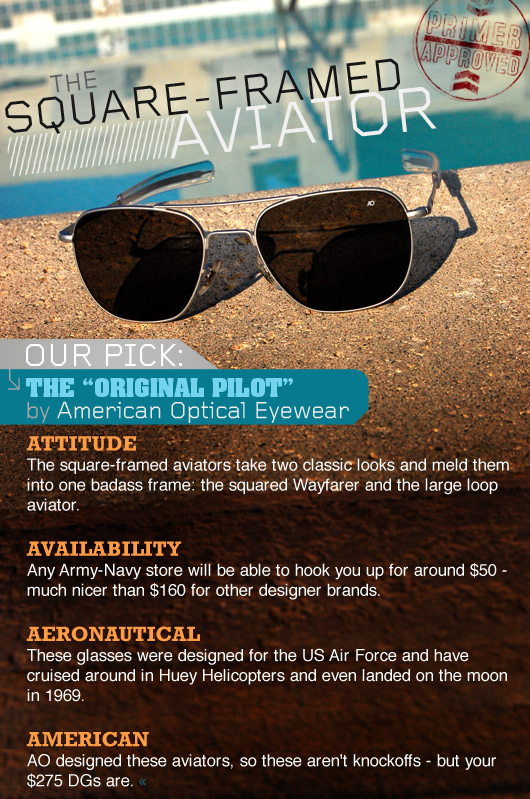 AO designed these aviators, so these aren't knockoffs – but your $275 DGs are. I didn’t realize you could pick these up at an Army/Navy store for so much cheaper. Do you have to be enlisted?